ALL OUR WINES ARE MADE FROM THE GRAPES OF OUR OWN VINES. WE ARE WINEGROWERS. Choosing the date to start picking is no easy task. The vagaries of nature mean that each year is quite different from the last. 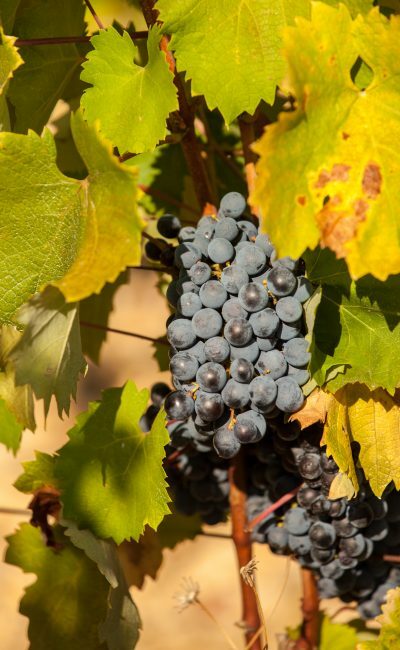 Incidents such as drought, heavy rain, cold or on the contrary torrid conditions in summer, all have a huge influence on the optimal maturity of the grapes and the personality of the vintage. In the weeks running up to September we visit each parcel regularly to evaluate the right moment for harvesting. Observation of the vegetation and the bunches, tasting of the grape pips and skins are all things that help us in our decision. The grapes are picked entirely by hand and only between the hours of 7.00am and midday to benefit from the cool of the morning. They are transported to the cellar in small, open topped crates. The afternoons are devoted to grape sorting. This is an important operation which eliminates all undesirable elements and makes sure that only the healthiest grapes go into the vats, to guarantee the quality of this wine in the making. The winemaking method adopted depends of numerous criteria, amongst the most important of which are the quality of the vintage and the grape variety in question. One thing remains invariable though, we never use commercially produced yeasts. We prefer to rely on the wild yeasts that have developed naturally on the grape skins over a period of many months. All our wines are made from grapes grown on our own vines. We are winegrowers. Excessive drinking is dangerous to your health. Please consume in moderation .